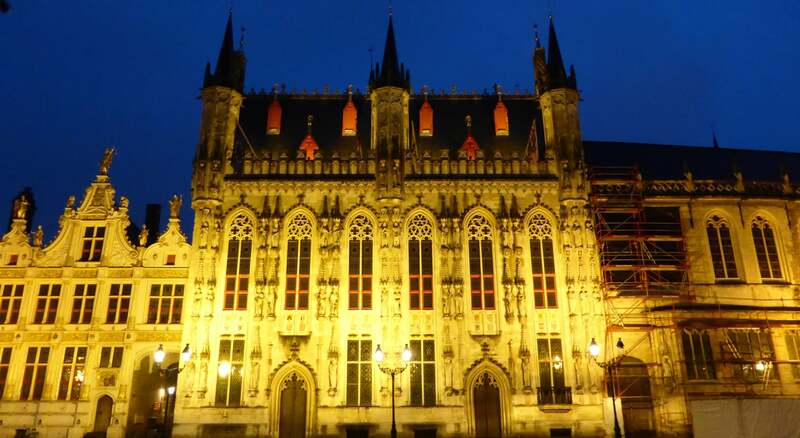 On our first night in Bruges, sated from a delicious meal at Breydel de Coninc, we decided to wander around and take some pictures of the buildings lit up at night. This is the town council or Stadhuis building built between 1376 and 1420. The next day we did a lot of walking despite the scattered showers. I had seen these little scallops in several locations in France and I finally stopped to take a picture of this one by a very picturesque bridge. I had no idea what they were until we got home and I posted this picture on Facebook. A friend of mine told me the scallop was a symbol used to show pilgrims the way of St. James. The Way of St. James is a route followed by pilgrims through much of western Europe and leads to the Cathedral of Saintiago de Compostella where the remains of St. James the Apostle are believed to be buried. 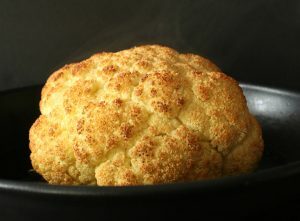 It was a very popular thing to do in the Medieval ages and is still traveled to this day. 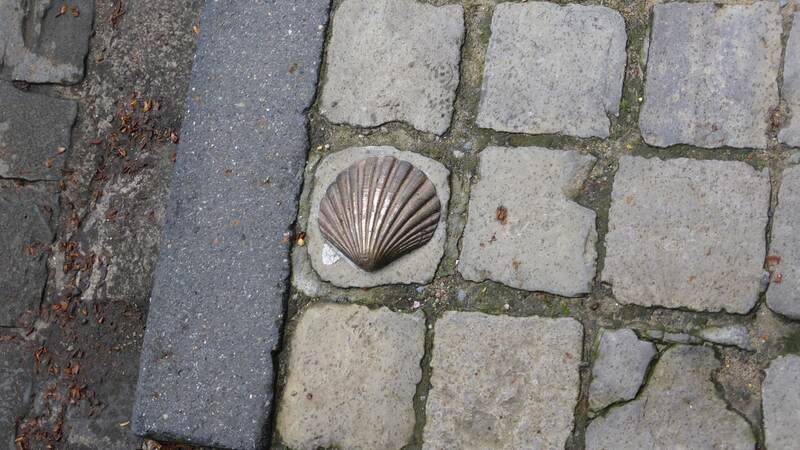 The Way winds its way through many European countries and all paths leading to Spain are marked with a scallop, thought its appearance varies. Along the pilgrimage route, pilgrims stay at hostels (Albergues) for which they pay a small fee. Walking along this ancient route there are a varied range of landscapes as it leads you through cities, towns, rural areas, mountains, beaches and along rivers. I think it would be the trip of a lifetime and one would be sure to meet up with other pilgrims along the way. Anyone want to walk across Europe with me? How about just Spain? 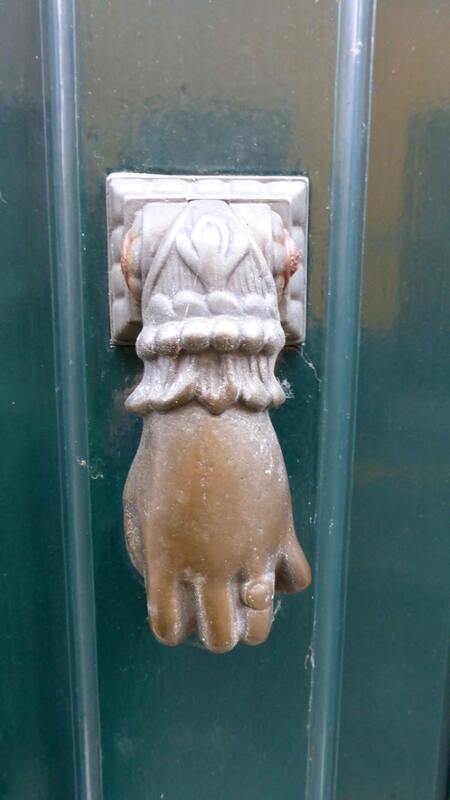 Another photo of a door knocker. I don’t know how many I took but they really fascinated me. I guess it was garbage day for St John Nepomucenus. This is a photo I took while on our canal boat ride. 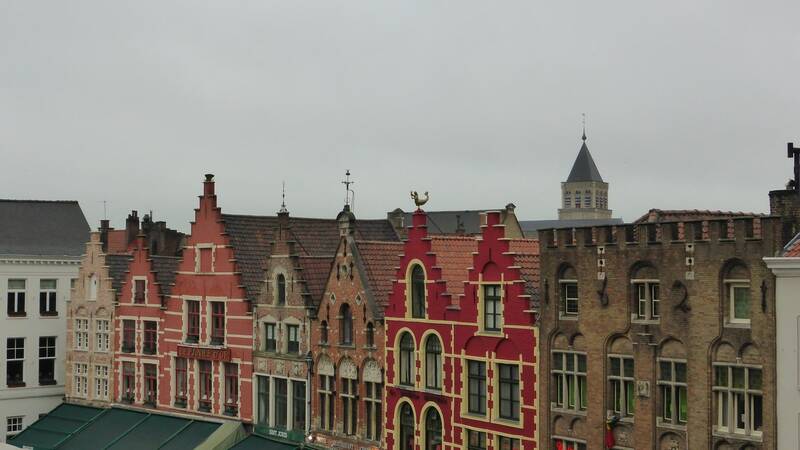 What a beautiful city Bruges is. Step-gabled houses along the Markt. We were told the more steps you had on your front, the better off you were. Those people in the pink house must have been loaded.You can also see the house with no steps, which was built in 1621, before step-gables were ‘cool’. The Markt in Bruges taken from the balcony of the Historium. 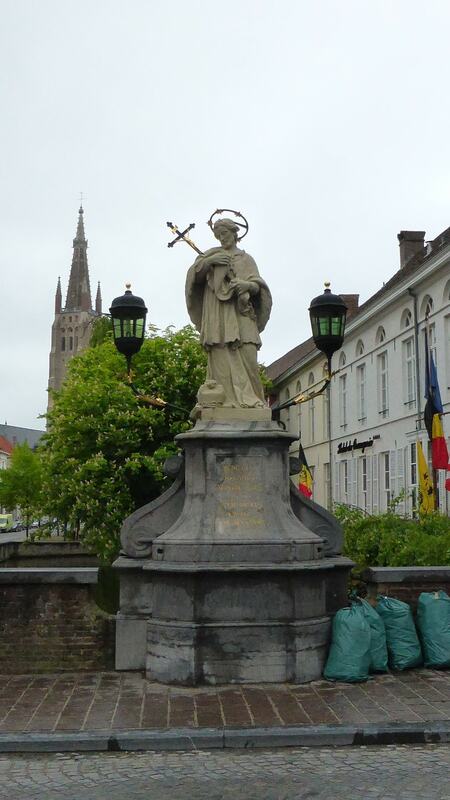 It is the oldest part of Bruges and is mostly over run with tourists. 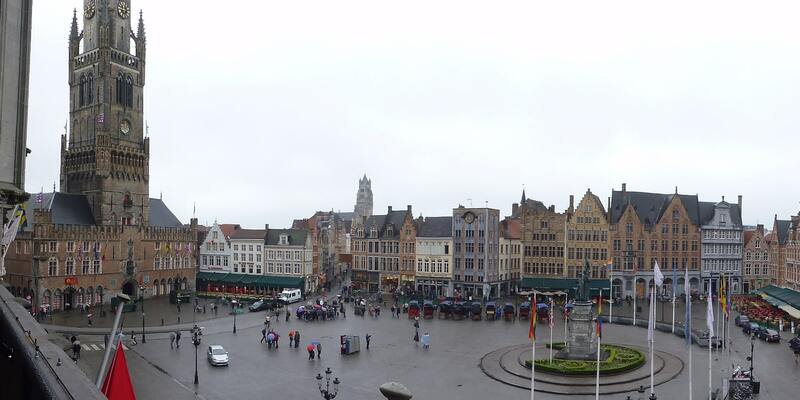 One the left is the famous Bell Tower and along the row of houses in the middle are two of Bruges oldest buildings. Notice there are not too many cars in the square, but only taxis and horse drawn carriages? One of the most interesting parts of our trip was accidentally driving into here. Yup, it was a challenge alright. Dodging tourists while navigating the one way narrow cobblestone streets was a memorable occasion. 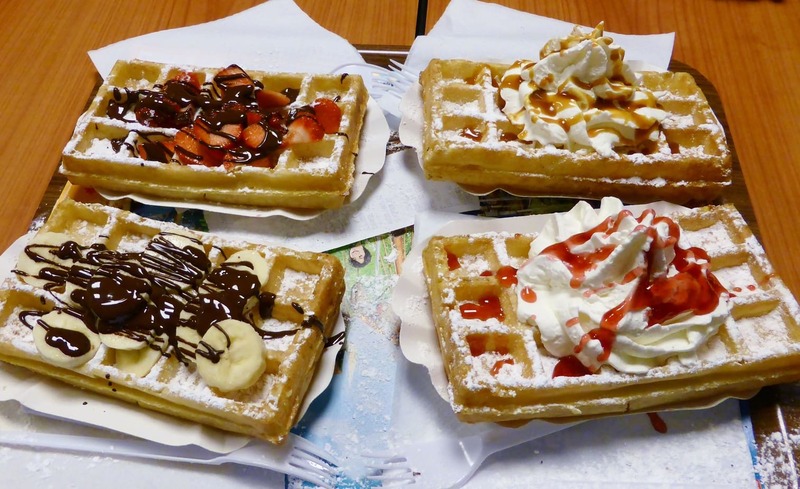 We really earned our waffles that day! Lovely, lovely photos. I love old towns and cities with lots of history. 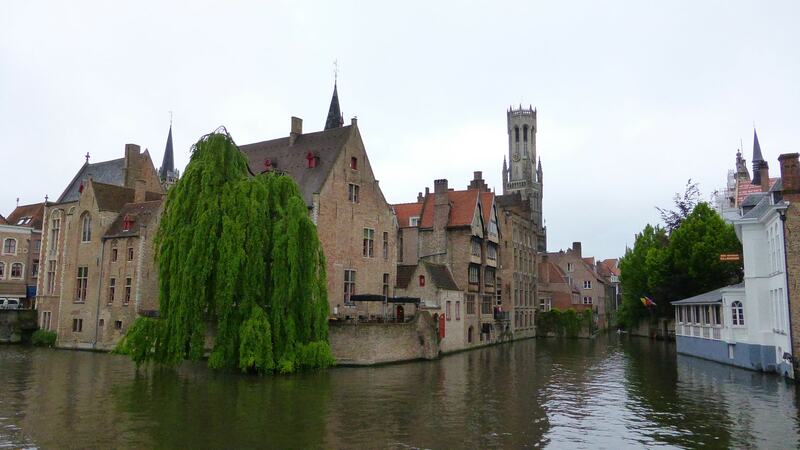 If you ever get to go to Europe…Bruges should be at the top of the list. It is one of the most undisturbed old towns as it was never touched by WWII bombs. The Markt is mostly unchanged. I’ve seen the scallop markers as well, and didn’t know what they were. I thought the pilgrimage was only within Spain but now I see it covers most of Europe – that would be quite some walk! I texted hubby right away when I was writing the post as the more information I was finding out about The Way, the more I wanted to do it. I don’t know about the longest leg which seems to go from Paris to Galicia. That would take an awful long time BUT I am dreaming about walking through Spain. Apparently it’s quite the trip….I’m already dreaming about the food! Wouldn’t you just love a return visit? Absolutely! It is a place you must visit more than once in a lifetime!